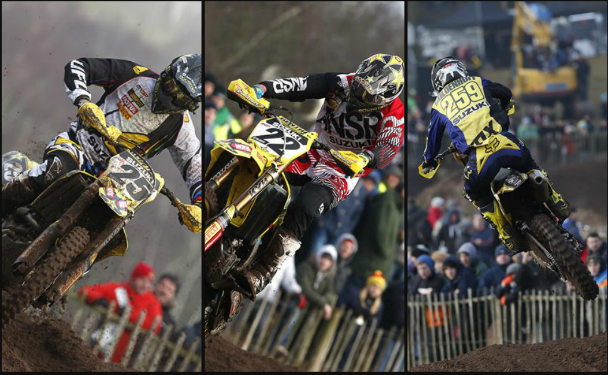 Rockstar Energy Suzuki’s Kevin Strijbos, Clement Desalle and Glenn Coldenhoff swept the podium in their first International race of the season at the Hawkstone Park International Motocross in the UK on Sunday. The 2015 Factory RM-Zs dominated practice, qualifying and all three races; World MXGP number three Strijbos winning the two main races, plus the Superfinal as Desalle raced-to runner-up slot in each. MXGP class rookie Coldenhoff also impressed with a 4-3-5 result in his first international debut aboard the Factory RM-Z450 after moving-up from the MX2 class. The Suzuki International Europe-supported rider was the fastest rider out of the gate in both motos - taking the holeshot - and he continued to lead for several laps until arm-pump forced him to slow, but fourth and third positions rewarded him third overall on the podium in his first-ever international outing on the powerful Suzuki RM-Z450.